Are you older and feel your competitive curling days are over? Think again, and look at the Ontario Grandmasters Curling Association events, designed for Ontario men curlers 70 years of age and older and women curlers 65 years of age and older, leading to the Verve Grandmasters Provincial Championship. Our events are sanctioned by the Ontario Curling Association. While curling for senior members in Southern Ontario was active, what was not available was a provincial championship for Grandmasters. 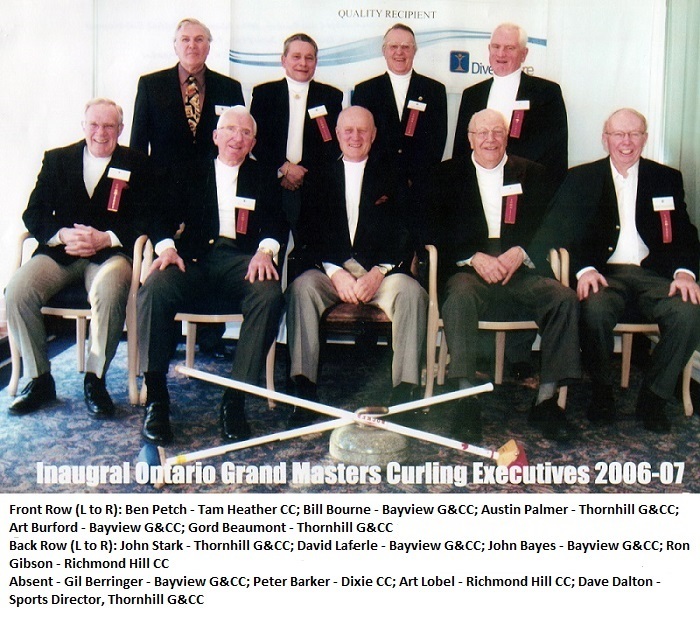 Austin Palmer of the Thornhill Golf & Country Club convened a group of like-minded individuals; the Ontario Grandmasters Curling Association was born. We had our first Provincial Championship March 23rd and 24th, 2007. To provide a provincial competition for 16 zone winners in order to determine a Verve Grandmasters Champion. To promote curling at the Grandmasters level in Ontario for men at least 70 years of age and women at least 65 years of age. To encourage other provinces to adopt their own Grandmasters Championship. To foster good relations with Grandmasters participants, our sponsors (listed on another page on this website and we encourage you to support them), The Thornhill Club and the Ontario Curling Association.